The award-winning Big Table is back – as the ‘small’ Big Table. 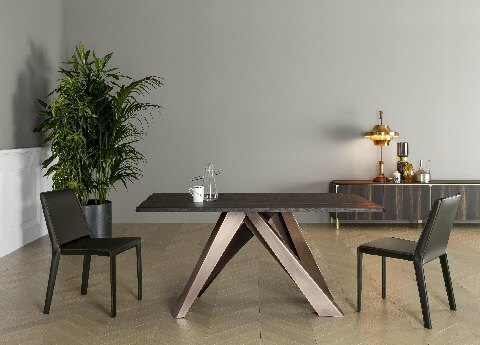 Bonaldo have relaunched Alain Gilles’ amazing design in a smaller, more compact version and with the addition of some stunning metallic finishes to the legs. Also new from Bonaldo, Roberto Paoli’s Cop table. The fun, innovative table legs are shaped like bottles and glasses and here you can see them in a beautiful burnished metal finish. How glamorous is that? Lots of other colours on offer for anyone not brave enough to buy into the metallic trend. 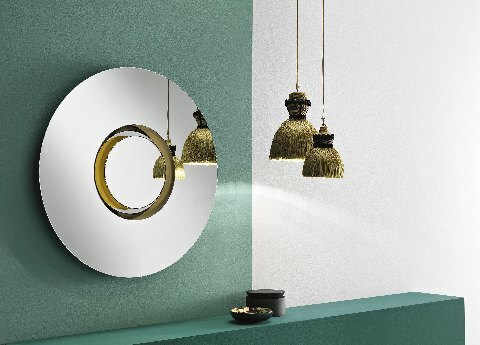 The beautiful Ozma Wall Mirror was created by Viola Tonucci for luxury glass furniture specialists Tonelli Design. It’s a large round and concentric shape, with a central rim in gilded metal, which can be removed and used as a table centerpiece. The lights are the Madama pendant lights by Mogg, the quirky Como based brand that produces innovative designs that are always a little outside of the norm. For sheer style, elegance and more than a touch of glamour whatever the season, you really don’t need to look much further than the wonderful Galotti&Radice. 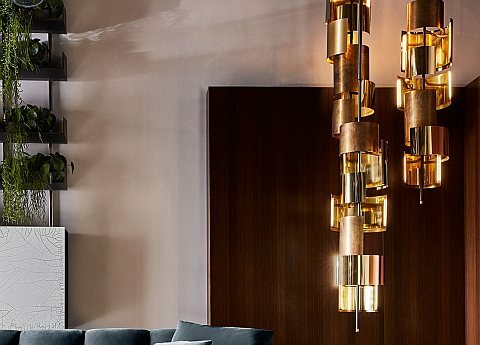 The exquisite Eris Ceiling Light is designed by Massimo Castagna for them, and as it’s hand-finished each piece is unique. The impressive 210 cm tall structure is painted in black bronze, with bright satin hand-burnished brass and black chrome components. So, here’s to a wonderful festive, shiny season with you and yours from all at Go Modern. Next PostNext Storage – some well ordered ideas!